Initial Consultation: During the first visit we'll take a look at your garden, discuss your requirements and style preferences, consider some intial design concepts, talk about your budget and run through some basic construction costs. Survey and Site Analysis: I'll conduct a full site survey, including levels and a detailed analysis of your garden. Design Drawings: I'll prepare a draft detailed design together with additional visuals for us to discuss at a review meeting. Once you're completely happy with the design I'll finalise all the drawings. These may include additional drawings such as construction drawings, setting out plans, drainage and electrical plans. Appointing a Landscaper: I work with various experienced landscaping companies and am happy to recommend any of them to build your garden. However, should you prefer to use your own contractor I can prepare tender documents and specification documents with which to obtain competitive quotes and am happy to manage the entire tender process for you. 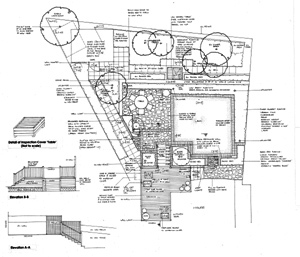 Building the Garden: Once construction is underway I can project manage the entire build, regularly visiting the site and being on call to all the landscapers and contractors to ensure the project is running smoothly and according to plan. Planting: Planting plans can be produced for all or parts of your garden, ensuring stunning borders that will thrive in your garden's aspect and soil type. I source the majority of plants at competitive prices from local nurseries. However, more specialist plants and semi-mature trees come from further afield. I have experienced gardeners who can carry out and implement the planting schemes. Product Sourcing: I am available to source any of the finishing touches for your garden, from pots to sculpture and furniture. Ongoing Advice and Maintenance: I offer ongoing advisory consultations to ensure your garden always looks perfect. I also offer hands-on sessions in which I can work alongside you or your gardener.